Thanks to a joint effort between the Kentucky Department of Agriculture (KDA), the state Finance and Administration Cabinet, the federal government, and Kentucky food banks, 314,496 meal kits from the Federal Emergency Management Agency (FEMA) were shipped to Kentucky and used to help feed the hungry. 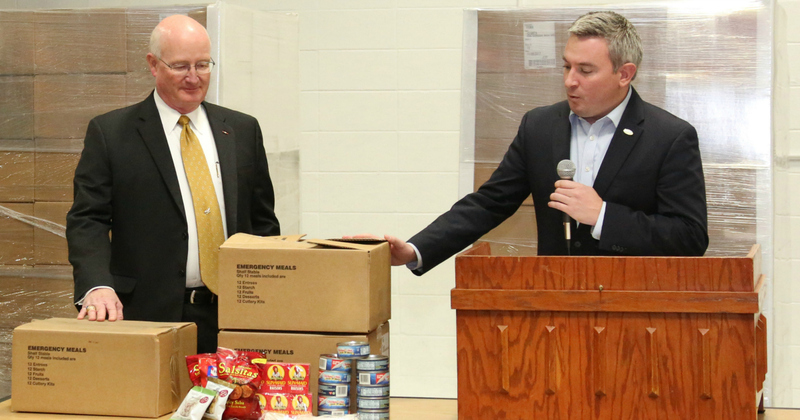 Agriculture Commissioner Ryan Quarles, right, announced the distribution of 314,496 meal kits from the Federal Emergency Management Agency (FEMA) which will be used to help feed the hungry in Kentucky. Quarles said the initiative was a joint effort between the Kentucky Department of Agriculture, the state Finance and Administration Cabinet and Kentucky food banks. Pictured with Quarles is Cabinet Secretary Bill Landrum, left. The surplus meal kits were originally purchased at the federal level for disaster victims. Late last year the General Services Administration (GSA) informed all state surplus programs that FEMA would be transferring these meals. Upon this notification, the Division of Surplus Property in the Finance and Administration Cabinet informed Bill Wickliffe, director of the KDA’s Food Distribution Division. Ultimately KDA staff contacted leaders of God’s Pantry in Lexington and Feeding America Kentucky’s Heartland, the agencies that distributed the meals, to ask if they would be interested in the surplus food. Quarles also wrote a letter to the GSA asking the agency to give Kentucky’s food banks priority to receive the meal kits. Since coming to office, Quarles has made alleviating the hunger issue in Kentucky a priority through KDA’s Hunger Initiative. KDA also created the Hunger Task Force comprised of various stakeholders including Kentucky Farm Bureau to work collaboratively in finding ways to combat Kentucky’s hunger problem. It is estimated that one in six Kentuckians suffer from some form of food insecurity. Working with the state’s agriculture industry was a natural fit to counter this problem and this initiative has set a standard for other states to follow, noted Quarles. In keeping with the collaborative effort theme, Finance and Administration Secretary Bill Landrum praised his team for working together to make this event a reality and a success. Michael Halligan, CEO of God’s Pantry Food Bank said the fact that there is a hunger problem in this state is still unknown to many people. Halligan emphasized that many of those needing assistance are finding themselves in this situation for the first time and are often reluctant to step forward and ask for help. “One of the things we try to do in food banking is, while we talk about fighting hunger, the reality is, we are delivering hope,” he said. The meals, which were purchased by the food banks, came just in time to be delivered to families throughout much of the state before the holidays. “I am deeply proud of our employees for their efforts, and I’m grateful to Secretary Landrum and his team for helping us spread a little extra Christmas cheer to Kentucky’s hungry,” said Quarles.